War! Huh! What is it good for? Absolutely nothing. Actually, war makes a great theme for some great card games. The theme of enemies battling it out seems to be one of the most commonly used in board games from Risk to Stratego. One of my favorite card games when I was a wee lad was War. A little too simplistic now for my taste, I seek games with more depth and games not entirely luck dependent. 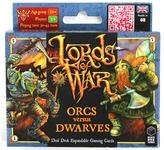 Lords of War is a fun little card game that is simple to learn and play, but offers a great deal of strategy. The game also offers a total of six different races you can play with which allows for different feeling battles and new artwork. The newest set (Templars versus Undead) was recently funded on Kickstarter and I can't wait to give that one a try with some new game mechanics such as card movement. But, I'm getting ahead of myself. Each player has a deck made up of a conglomerate of different units/types, the most important distinctions being the six leader cards. The leaders make up your most powerful units, but one must be careful because the loss of 4 of these and your army will go into chaos unorganized and your opponent wins. If you don't involve them at all, your forces may be killed off too quickly and your opponent will win when he has been able to remove 20 of your units from the field. That is only part of the strategy you will need to ponder - the balance of using your leaders, making them exposed, and keeping them protected and safe is a delicate one and a great element to the game. The game at its heart is a strategical card placement and mathematical game. Each card has a defensive value and then will have some sort of number(s) representing an attack value. These numbers also have a direction associated with them. Cards vary. Berserker units usually have a large attack value (say 5), but it may be very targeted (only one direction) and the unit will have a very low defensive value as they are focusing on attacking rather then what will happen to them. Some units will be able to attack only behind them, and others a good range of all around them. There are also range attack units that can strike from a distance (these can be vital, but usually are very open to attacks as well). After a card is played, the field is evaluated and all units attack simultaneously. Units are removed and kept by the opponent as a "trophy" to help keep track of the "score." You can also determine to have a shorter length game by agreeing on a number besides 20 (15 or 10 etc.). When playing cards, the majority of them can only be played by "engaging" an opponent's card. This means that the card you are playing must have an attack arrow facing an opponent's (next to that card - including diagonally). This keeps the game moving very nicely. The only exception to this rule comes from playing a few unit cards that are considered "support" cards. 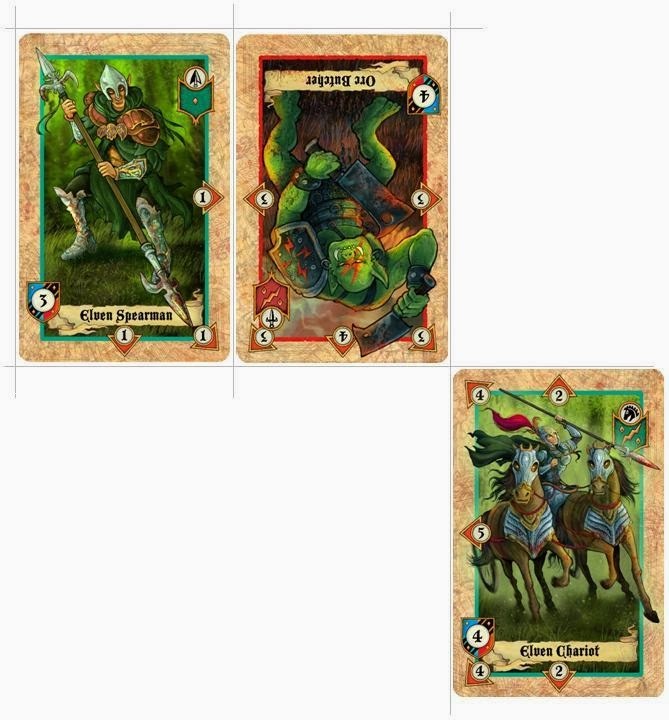 They are allowed to be played adjacent to any of your own cards (these are the ranged units and spear units). These units can help protect your own cards or you may play these so they are safely protected by other units (perhaps a range unit being played away from immediate enemy peril. I love that the game doesn't get too complicated. There are few other rules you can add to play an "advanced" version, and the new Templars versus Undead adds some fresh new things to enjoy with the possibility of getting Weather and Terrain expansion - you can always spice things up a bit too. The card quality is good, and I really like the packaging - it has a little flap that keeps the decks separate from one another and everything fits nicely with the playing mat. I'm a huge fan of fun 2 player games and this is a great one to add to any collection. The game does have some luck elements to it, and it is possible that you can have a hand full of similar type of cards or cards that really won't be any good for you right now. That can be frustrating at times. Some people may feel a bit limited by the rule of card placement, but it is there for a reason. I'm giving Lords of War a 3 Fingers Up or 8 out of 10 stars. The game is solid and very enjoyable and that is How Lou Sees It! A big SHOUT OUT to Black Box Games for providing the review copies making this review possible. Can't wait to try the new set!